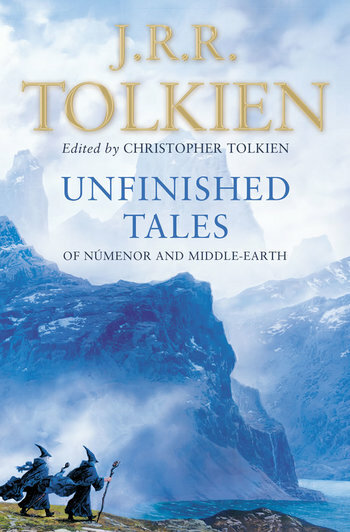 Unfinished Tales of Númenor and Middle-earth by J. R. R. Tolkien, or Unfinished Tales for short, was the first posthumous publication of unfinished and fragmentary material that forms part of the backstory of The Hobbit, The Lord of the Rings and Middle-earth. It was compiled and edited by the author's son Christopher Tolkien, who had also assembled The Silmarillion from such material (with the help of Guy Gavriel Kay). It was first published in 1980. The stories take various formats: Some are pseudo-history written in a scholarly manner while others are actual narratives. They can be entertaining in their own right and give interesting details like the political organization of Gondor and Rohan, details about the ancient realm of Númenor, and a rough draft of The Children of Húrin, among other things. A gift for any true Tolkien-geek. Much more material of the same type would later be collected and published, more systematically, in The History of Middle-earth. Action Girl: In some versions Galadriel wielded a sword at the Kinslaying at Alqualondë on the part of the Teleri, her mother's people. Anti-True Sight: There is a brief reference to 'shrouding' objects from the vision of a palantír. City of Adventure: Bree in "The Quest of Erebor" and "The Hunt for the Ring." City of Spies: Bree in "The Hunt for the Ring." The Chessmaster: In "The Quest of Erebor" (a "special feature" of The Hobbit) when Gandalf and the dwarves met at Bree before visiting Thorin accuses Gandalf of having more in his mind than Thorin's troubles. Gandalf replies that of course he did - He was a chessmaster and that was why his advice was so good. Daddy Had a Good Reason for Abandoning You: Turns out all those years Aldarion was missing from home (time his own wife spent instructing their daugther to hate him, and men in general), he was helping the elves and men of Middle Earth prepare against the upcoming threat of Morgoth's former servant: Sauron. Disproportionate Retribution: The Curse on Túrin was given by Morgoth because he was angry at Húrin for defying him. This would also be Revenge by Proxy and perhaps Sins of Our Fathers. Morgoth, of course, was not normally known for being nice anyway. Gondor Calls for Aid: Not the Trope Namer, yet the original, which resulted in the creation of Rohan. While losing badly in a war with Easterlings, Gondor made a last-ditch hopeless call for help to the northern horse-lords (known then as the Éothéod), with whom they were friendly but had no formal relations. Eorl didn't send an answer back, which made the Gondorians even more despairing, but that was because Eorl was coming himself with all of his warriors. The ruling Steward of the time granted Eorl the mostly-uninhabited lands to the north, turning the Éothéod to the Rohirrim. There's the Unfortunate Implications that the existing small population don't matter. The survivors (who aren't killed, enslaved or assimilated) are the ancestors of the Dunlendings, and the two peoples are still doing nasty things to each other five hundred years later, but no-one ever seems to join the dots between this and Cirion's mismanagement. The Handler: In "The Hunt for the Ring" The Witch-King captures an agent of Saruman's and intimidates him into serving Sauron. Hidden Depths: The Quest of Erebor reveals that Thorin was far more conflicted and doubtful than his proud and egotistcal behaviour in The Hobbit let on, to the point where he almost called the whole thing off in Bag End. Last Stand: "Disaster of the Gladden Fields". MayflyDecember Romance: Aldarion and Erendis on Númenor. Aldarion as a member of the royal house of Númenor lived 398 years; Erendis lived only 214 years. Making matters worse, Aldarion spent many of those years on long voyages to Middle-Earth. Erendis was not happy; their daughter, the future queen Tar-Ancalimë was severely scarred. Meta Fiction: "The Quest for Erebor" is told by Gandalf to the Hobbits and Gimli at Minas Tirith. My Girl Back Home: "Aldarion and Erendis" is about a Númenórean prince who ruins his marriage because of his love for the sea. Noble Savage: The Drúedain, also known as Wild Men and Woodwoses, who are somewhat like Neanderthals in appearance. They also have magic powers. Perspective Flip: "The Quest for Erebor" is the events of The Hobbit (and preceding it) from Gandalf's perspective. Poor Communication Kills: Partial example in "Aldarion and Erendis"; apparently he never thought of mentioning that while he was off cruising, he was helping the elves fortify against Sauron. Something Completely Different: Heroic Fantasy-style adventures, epic tales of the struggle between the Free Peoples and the forces of Morgoth and Sauron, histories of the ancient land of Westernesse, explanations of how palantir worked and who the Druedain were... and in the midst of it all, an incredibly mundane tale of how a man and woman fell in love, got married, came to blows, and split up. The Spymaster: The Witch-King in "The Hunt for the Ring." Worthy Opponent: In "Cirion and Eorl" an ancient campaign between Gondor and its allies against the Wainriders is opened by Gondorian agents engineering a slave revolt in the Wainriders' country while the men were away at war. The Wainrider women defend their homes against the rebels and are praised for their valor. Interestingly this is one of the few times Tolkien uses this trope in detail, although it is implied elsewhere that Easterlings and Haradrim have Worthy Opponents among them. You All Meet in an Inn: "The Quest of Erebor".